Globalization and increasing legislative complexity have brought high levels of market pressure to food companies, hampering production and supply chain management. Companies are urged to develop risk-based management frameworks to prevent notable losses and protect their reputations and licenses to operate, thus ensuring sustainable future performance. 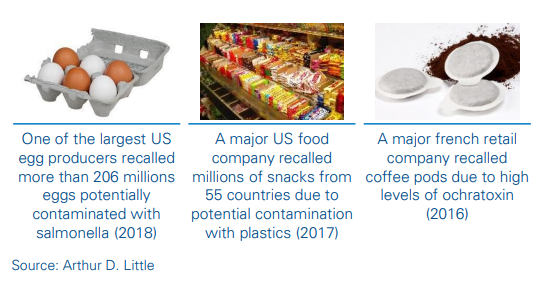 Some cases of contaminated food have indicated that product quality risk is one of the main vulnerabilities in the production and global supply chain. A series of company scandals have hit the food industry in the past years, affecting reputation and causing product recall, with notable losses as a consequence. 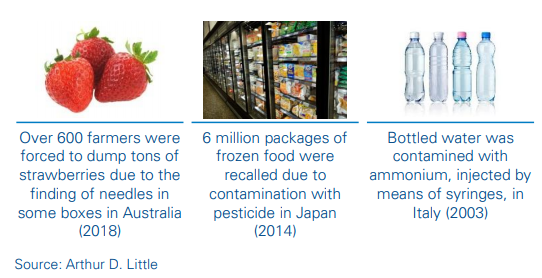 Statistics show that the number of cases of contaminated food has increased, as well as that of recalls. It is widely known that product recalls represent a major concern for businesses, as they typically involve assembling a crisis team, removing the product from the market, investigating and addressing the cause, and managing the public relations fallout. 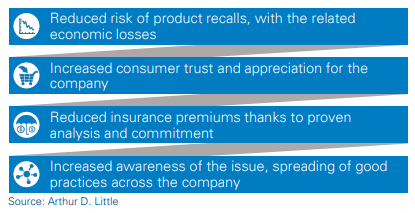 What’s more, indirect costs depend on the circumstances of recall events, and involve litigation, stock-value decline, fines, loss of sales, and potential industry impact. The damage to public opinion is typically very strong, and may irreversibly affect the company’s reputation. Despite an increasing number of guidelines having been issued by international institutions in recent years, also focusing on intentional contamination (e.g., PAS 96:2017 “Guide to protecting and defending food and drink from deliberate attack”, by the British Standards Institution), their application in complex environments is often difficult: many food manufacturers and retail companies lack structured food safety and defense plans. These, implemented through a risk-based approach, are key to preventing, mitigating and monitoring possible sources of food contamination. The origin of product contamination can be divided into two large categories in relation to intentionality. Accidental contaminations stem from unintentional human actions or other unexpected events, which typically occur in one or more activities carried out along the supply chain. Intentional contaminations involve deliberate actions aimed at compromising food destined for human consumption. The final purpose is to cause injuries, death and/or the breakdown of social, economic or political stability. Relevant past cases are given in the following figure. Arthur D. Little has developed a structured, homogeneous and quantitative framework to drive food safety and defense in complex organizations in the food industry; based on a tailormade approach, a risk assessment can be applied to a wide range of manufacturing facilities, logistics hubs and retail stores, and adjusted for specific procedures and services (e.g., home delivery). The framework consists of four main phases: 1. Scope definition; 2. Development of a tailored risk assessment tool; 3. Risk mapping; 4. Definition of risk reduction strategies. Food exposure to contamination highly varies, depending on the surrounding environment and particular activities performed by the organization. Hence, the first phase consists of understanding the client context. Preliminary on-site visits and interviews to department managers and operating personnel are recommended to gain insight into relevant issues and consolidate the analysis perimeter. Clear comprehension of the client’s needs and strategy (e.g., its willingness to strengthen employees’ awareness, rather than investing in new technologies) is key to deploying effective tools to conduct the study. The framework is based on a macro-micro approach: each area/ activity within the perimeter is divided into sub-areas and then key variables. Such variables represent the factors potentially impacting the frequency of occurrence of the contamination event. Each area, sub-area and key variable is given a weight based on its relevance. Therefore, a checklist containing an algorithm can be structured to estimate the unwanted event frequency. 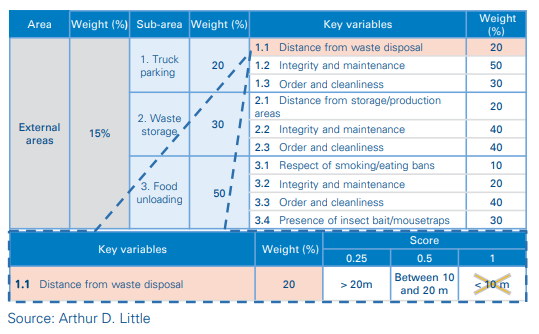 Hence, the on-site assessment is carried out, assigning a score to each key variable: a simplified checklist extract of an unintentional contamination risk assessment for external areas is given below. The overall result is a normalized value of frequency as a combination of weighted key variables. A polar diagram gives an immediate overview of critical issues. Three thresholds are also identified based on the algorithm, and can be tailored based on specific needs: a “low” frequency (green) one represents a “comfort” area, while the “moderate” and “high” ones require increasing levels of attention. Risk maps give an immediate overview of the company portfolio and its risk level; the assessment can be replicated periodically, and the map allows analysis of the performance trend. Examples include benefits introduced by new technologies and procedures, worsening performance due to portfolio expansion in less regulated countries, and acquisition of activities with risk management measures that are still embryonic. 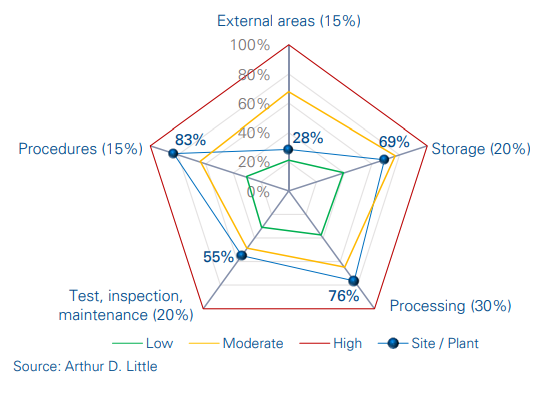 Risk mapping is recommended for organizations with complex and differentiated portfolios. High- and medium-level recommendations are provided to close relevant gaps and align food safety and defense practices in similar areas. A need for additional in-depth analysis may result from the outcome of the risk mapping. In this case, a detailed on-site visit is performed to look for strengths and weaknesses in the entire process, and focused recommendations are provided for each improvement area. Strategies to reduce risk typically involve both technical/physical improvement actions and human factor/procedural ones. 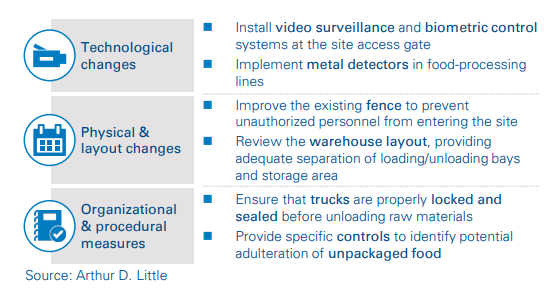 An example of relevant measures to enhance food defense management is reported below. Further actions are “quick wins”, as they refer to human behavior and can be promptly put in place, leading to an immediate risk reduction (e.g., ensuring that cleaning and sanitizing chemicals are stored in designated areas while not in use). Identification of corrective actions should be made, considering that some risks can only be reduced to lower thresholds; these represent “residual risks” that cannot be erased. Moreover, implementation of improvement actions highly depends on the company “risk ambition”, which should consider both the risk exposure if the action is not implemented and its feasibility. It should also take into account budget and time constraints. It is therefore essential to adopt structured approaches to support management in its decision-making process. A cost-benefit analysis supporting the prioritization of investment options helps with selection of corrective actions and their prioritization, and it facilitates the development of a structured investment plan over time. What kinds of benefits could food players expect? Our experience in food safety and defense proves that a structured product contamination risk analysis yields several advantages, on both an economic and a reputational level. It is widely known that food contamination has a strong impact on community and public opinion. Some products, such as baby food, are even more sensitive. If not prevented and promptly detected, such events may cause irreversible damage. The client was a major dairy manufacturer, with production plants in Italy and worldwide. Its baby formula was a niche product, with specific characteristics that made it more sensitive to the risks of accidental contamination. We interviewed key personnel and organized workshops to gain knowledge of relevant issues, and then developed a checklist with which to perform the on-site visit and assess quantitatively the current level of food safety practice implementation. The result was a detailed report that included improvement areas and recommendations, together with a risk assessment for each analyzed area. Therefore, we supported site management in its decisionmaking process by providing a cost-benefit analysis of the suggested corrective actions. Preventing acts intended to cause large-scale harm to public health or compromise the company reputation is a must for large manufacturing and retail players. However, strengthening security measures within a complex organization can be difficult and costly if not supported by a risk-based approach. The client was a major Italian food manufacturing and retail company, with production sites and over 100 food stores. The aim was to enhance food defense practices along the value chain. We supported the client in drawing up a risk assessment tool based on proven international requirements, and performed on-site visits to distribution hubs, manufacturing plants and selected retail stores. The outcome consisted of risk maps showing the current exposure to intentional contamination, and common/ specific improvement areas. We coordinated and monitored the action plan development and defined the frameworks for reporting the progress status of food defense practices. National and international organizations issue legislation and good practices applicable to the food industry; however, structured risk assessments to go beyond legislative requirements can identify dormant issues early, before they turn into non-conformities or threats to human health. Our quantitative framework allows approaching the risk throughout the food supply chain, including analyzing both accidental events and deliberate acts. The methodology ensures a consistent, reliable way to gain insight into complex organizations, and is suitable for a wide portfolio of food players. 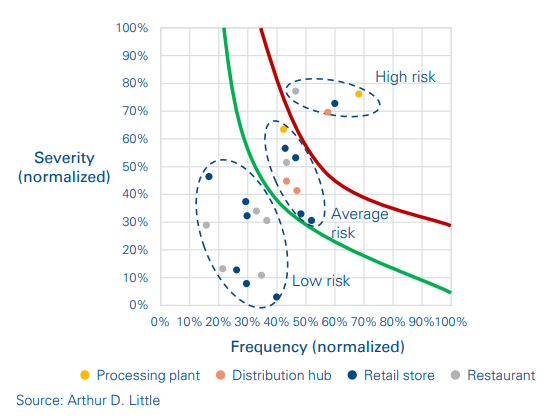 Food manufacturers, logistics operators and retail companies could all benefit from structured plans to prevent and mitigate the risk of food contamination; it translates not only into safer and more reliable services to clients, but also recall cost reduction and reputation enhancement towards customers, consumers and stakeholders.